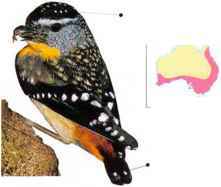 Spotted Pardalote l Isually seen singly or in pairs, this tiny, brightly colored bird forages in the upper foliage of trees for insects, which it catches in passing, often taking them from the undersides of leaves, in the random method known as "gleaning." As a treetop bird, it is more often heard than seen. • NliST A domed nest, made of bark fragments, either at the end of a tunnel dug into a bank or in a tree stump. 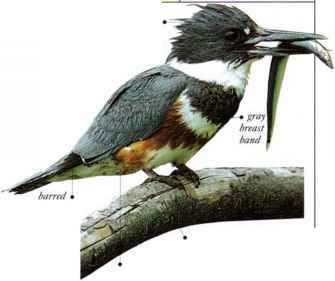 I his small, short-tailed bird lives in rain forest, open forest, and scrubland. It feeds particularly on mistletoe berries (voiding their sticky seeds unharmed on branches, where they germinate and grow) and also takes nectar, flower petals, antl insects. Mistletoe-birds form small, nomadic-flocks, which move about the foliage from tree-to tree in search of fruiting mistletoe plants. • NliST A domed, hanging nest of plant down and spiderwebs. placed in a tree.